I started with a chain of 80 stitches, but the amount of stitches of course depends on the yarn/hooksize you’re working with. Just make sure the chain – when closed – fits comfortably over your head. Close the chain – and crochet dc’s all around in this first round. Then chain 3 (first dc of next round) and crochet 20 dc’s. Between dc number 20 and 21, you’ll now crochet: 2 dc’s, 1 chain, 2 dc’s. Continue crocheting until you are at the exact opposite side of your first corner at stitch number 60. In between stitch 60 and 61 you’ll crochet the start of your second point: 2dc’s, 1 chain, 2dc’s. Close round with slip stitch, chain 3 (first stitch of round 3), continue dc-ing one dc in every stitch until you’ve reached your first point again. In between the 2 sets of dc’s you’ll crochet: 2 dc’s, 1 chain, 2 dc’s. And basically that’s it – it’s really that simple! 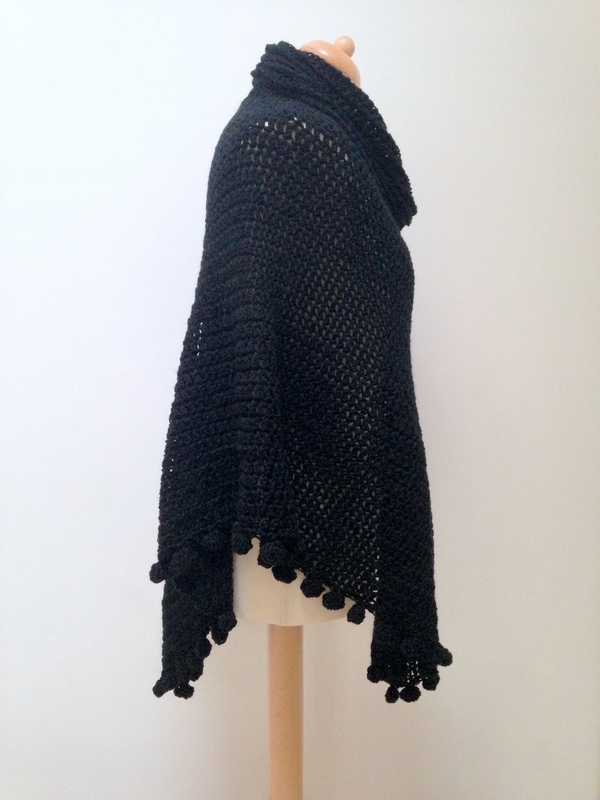 You yourself will have to decide how many rounds you’ll want to crochet, just try your poncho-to-be on a couple of times to see whether you like it lengthwise – if not, crochet on. My poncho has 32 rounds. At that stage I started crocheting the pom poms – you’ll find info/tutorials on those here, here and/or here. Depending on how big you want your pom poms, you’ll want to add loops on your hook – I made sure I had 6 loops on my hook before I pulled my yarn through. 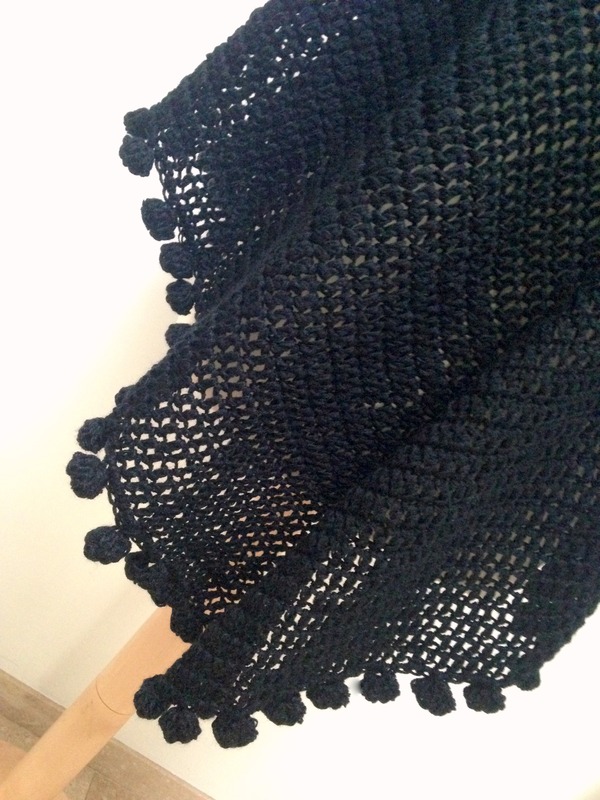 Since I wanted some sort of a cowl on my poncho, I picked up all 80 stitches that I had started with, using sc’s. A ribbed look was what I was after, so I turned my work after every round of 80 sc’s and of course crocheted the back loops only. 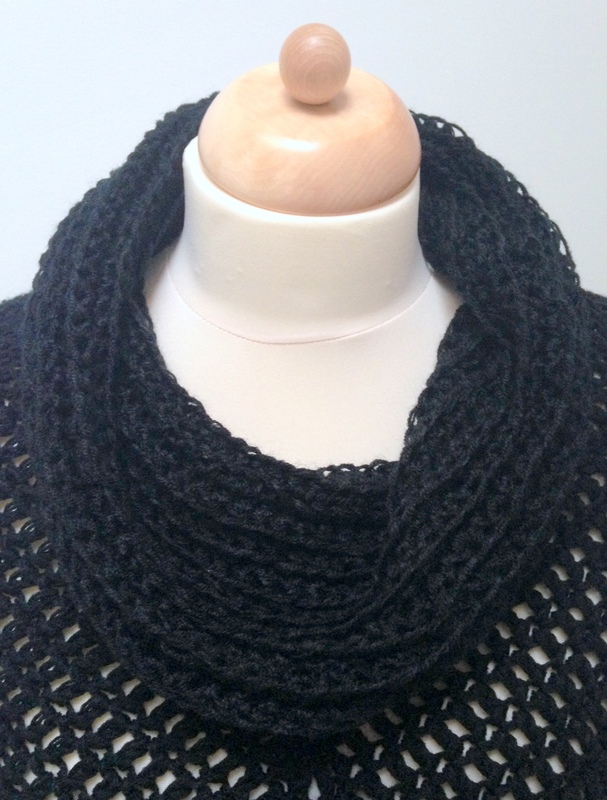 Again, you’ll have to decide what length of your cowl you’ll be comfortable with – my cowl has 22 rounds. I finished it off with a simple crab stitch.